Chess Grandmasters are the successors of a long tradition throughout the world. Anyone who could play this game well has won admiration from the general public and high society alike. This is true no matter how far back you go or what country you think of. Great chess players have played in front of Sultans, Kings and Presidents the world over for many centuries. People would gather in chess cafes and clubs to watch them weave magic over the board. People will never agree on who is the greatest player of all. It's very subjective and we all tend to have our favorites. For some reason or other some player or another will capture your imagination and that's that. Who do you think is the greatest? 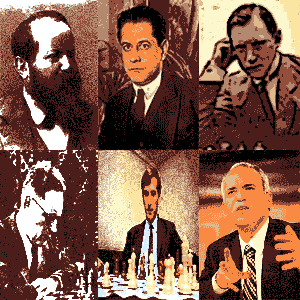 Throughout history so many players have wowed the world of chess. Great games have been played, enriched with incredible combinations. Remarkable genius has also on occasion been witnessed through the prism of flawless positional strategy. Some games are also remembered for brilliant individual moves. Others for sustained and incredible, violent attacks. Still more for unbelievable defense from a player in the face of all out assault before taking victory themselves. These masters become immortal through their brilliancies. Many players have variations or entire opening systems named after them in recognition of their contribution to chess. There are so many criteria on which you can judge a player's greatness. The greats leave their mark in so many different ways. We all probably have a player whose style we admire the most. Who is your favorite chess player? Who Was The Greatest Chess Player Of All? There have been many great players down through the years, decades and centuries. There does not seem to be an undisputed greatest. Different people have different opinions. Who do you consider the greatest? Why not write a piece on the top chess player of all time. Tell us what sets him apart from the rest. Or even do an article on one of the greatest who you think deserves a mention for his services to chess. Your player doesn't necessarily have to be the greatest all rounder. He can be the greatest tactician or greatest endgame specialist or have some unique and interesting style. Can you think of a player who should be talked about? Put forward the case for Your Greatest Chess Player Ever.